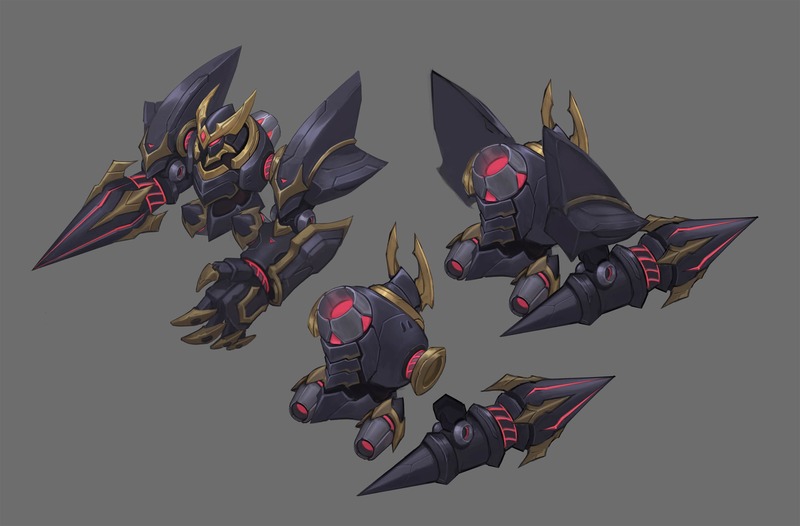 We originally set out to make one Blitzcrank skin, but somewhere along the way, we realized there was a second, complementary skin to the one we were working on. Rather than putting it on the backburner, we kind of just went for it: Could we create a second skin simultaneously, without adding too much time to development? Usually one of the first things we do when developing a new skin is create a clear thematic goal from which to work. Something like: “We’re going to make Arcade Blitzcrank, now let’s figure out what that looks like.” But when we started brainstorming the next skin for everyone’s favorite Steam Golem, we tried something a little different. This time around, instead of starting with a thematic goal, we asked ourselves, “What’s the most impactful part of playing Blitzcrank, and how can we make that feel even better?” The answer? The hook. Always the hook. Whether you’re playing as Blitz or against him, you’re always focused on his Q, so we decided to start with the hook and let that guide the rest of the design. There were a lot of designs we liked, but we eventually went the Dark Lancer direction. 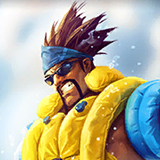 We felt like this hook hit the power fantasy the best, and Blitzcrank was lacking a skin that had this type of sinister aggression. Plus, its metallic nature felt heavy and weighted, as if it was going to seriously mess you up. Blitzcrank’s hook is scary—and it should feel that way when it’s flying at your out-of-position ADC. As we got further into design, we realized this direction had a clear opposite: a Light, to complement the Dark. This realization brought a new excitement to the process, and our concept artist began developing the Light version. As soon as we saw it, we knew we wanted to make it for players—it was just too cool not to—so we decided to try creating a second skin without shifting time away from upcoming projects. Lancer Rogue Blitzcrank in early stages, shooting a prototype of his new hook from his old body. 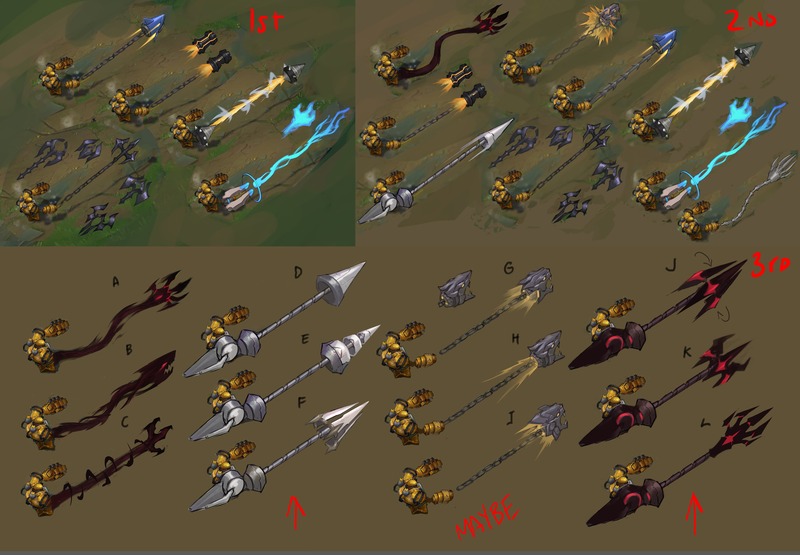 Since we were already in the process of creating the Dark Lancer skin, we were able to use what we’d learned so far and apply it to making the Light Lancer skin. There were also just raw technical advantages; with some effort and creativity, we found we could use the same rig and animations for both skins. This freed up some extra time for us to focus on making a new character model, new VFX and SFX, and a new recall animation. Our goal was always for each skin to feel unique, even if they share a theme (and some under-the-hood features). We learned a lot of lessons during this process.. For one, we didn’t know we were making two skins when we first began, so we didn’t start making two splashes. 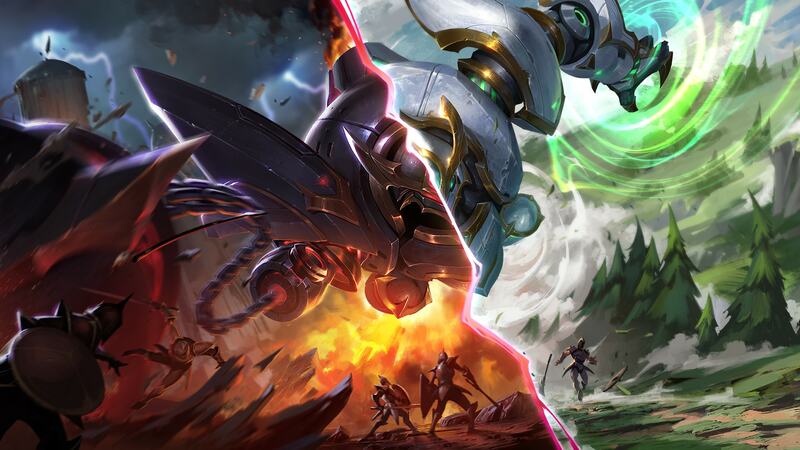 We thought maybe it’d be cool (and efficient, production-wise) to see a splash that was divided down the middle, with half being Dark Lancer and the other half Light Lancer. And it was cool. But it didn’t seem like a great experience for players who really loved just one of the skins. We were worried about delivering something that would make players unhappy. Our splash artist wizard came to the rescue. Splash art requires a lot of attention to detail—even something as simple as changing the pose of a character can require a lot of extra effort—so instead of starting from scratch, the artist built off of the original illustration. He painted each of the “missing” halves, one for for each skin, so that each would have its own unique splash art. Also, double the skins = double the bugs. At the time of writing this, we haven’t put Blitzcrank onto PBE yet. But we’re bracing for a harder-than-usual bug situation, with an accompanying longer-than-usual dev time for fixing them. Still, we think the result (two rad Blitz skins), experience gained, and lessons learned are totally worth the extra effort, and as a Blitz one-trick, I’m excited to finally have a gold chain Blitzcrank. This was a brand-new process for us, and we’re excited about the unique opportunities it’s opened up for the future. That said, we’ll be scouring the forums, reading feedback and identifying what worked and where we can improve. Thank you for everything, and don’t forget to stand behind your minions! Riot AdamUnicorn works on League Skins and Team Management. He makes really good pies.